Poor Golf Digest. They had no idea of the controversy that would unfold when the magazine's January 2010 issue went to press November 14, well before news would surface of Tiger's numerous affairs. 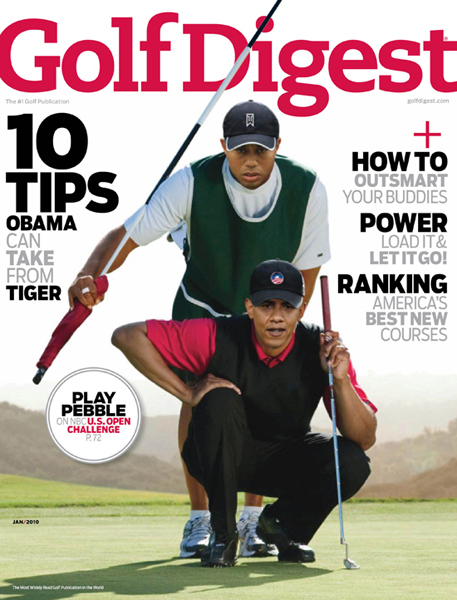 In the January 2010 issue of Golf Digest, there is a picture of Tiger Woods giving Obama golfing lessons- the cover story being, "10 Tips Obama Can Take From Tiger." Ironically, there's also another story mentioned on the front page entitled, "How To Outsmart Your Buddies." Funny cover! Unfortunately, both of them got caught screwing around. Tiger was caught screwing around on his wife. And President Obama was caught screwing up our economy, screwing the unemployed, and screwing his supporters for sending more troops overseas! Hence, his polls dropping from almost 70% to 45%, It's very sad on both accounts.